Jazz.Coop is delighted to promote this jazz workshop, involving some or our members, at the innovative venue The Barn at Easington. 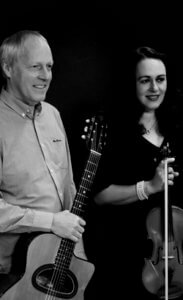 One whole day of Gypsy Jazz workshops with acclaimed tutors Emma Fisk and James Birkett of Hot Club du Nord. Plus a guided Fireside Jam. All in the beautiful surroundings of the Barn and Caravans. Django would have been right at home! Gypsy Jazz is traditionally played by violin, guitar,accordion, clarinet and double bass but other instruments welcome as long as they are fully chromatic. No previous experience of Gypsy Jazz necessary as long as you are a reasonably proficient player. Workshops from 10.00 til 5.30. Informal Jam from then onwards. Camping available (book separately) for those with stamina who want to go on playing til the small hours! Once you have booked please email thebarnateasington@hotmail.com telling us your instrument and any special dietry requirements.